In 2017, Weldmar Hospicecare held its first ‘Open Gardens’ event throughout Dorset – with gardens open to the public from April to October. A total of 36 gardens were available to the public during this event – and they helped to raise over £4,000. Alaine Harman, Weldmar’s Community Events Fundraiser, organised the 2017 event – and is now looking for keen gardeners who would like to support the charity this year. 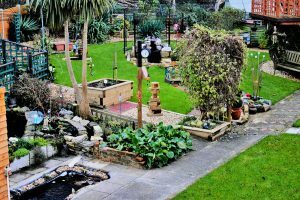 John Simpson of Upwey opened his garden for Weldmar in 2017. The engineer has created an amazing breadth of horticological interest in his back garden. John said “There’s a stream running through the middle, ponds stocked with fish, newts, toads and other species. I have a ship-style gallery in the middle, surrounded by blooms of every hue, and relaxing places to sit and watch the flora and fauna. I really enjoyed opening my garden for Weldmar last year. The Fundraising Team were really supportive, and helped me with everything. I’m looking forward to being involved again in 2018”. Alaine said “Weldmar would really like to have gardens across Dorset in this year’s event – and you could open your garden on just one date, or a few throughout the season. You could just invite your family and friends, or involve your whole neighbourhood. We’ll work closely with you to organise your events, and help you make it a success”. If you are interested in being part of the 2018 Open Gardens for Weldmar, contact Alaine on 01305 261800 or fundraising@weld-hospice.org.uk before the end of February, so that you can be featured in their promotional booklet and on their website.